Technology is effectively used in Navagni™ to burn the biomass fuel efficiently. Qpre™ recognized the benefits of top-lit updraft gasification technology and enhanced it to achieve the performance standard and the valuable features. Navagni™ with enhanced technology burns fuel and holds the heat effectively. This will allow for less fuel to be used for cooking. The fuel chamber can hold up to 1 kilogram of fuel in one full load. This amount of fuel is expected to providing cooking time of around 45 minutes (in normal cooking conditions) without refueling. It is projected that Navagni™ can reduce fuel consumption by almost 50-60% compared to traditional biomass cooking stoves. Savings of fuel usage simply means real savings in money on an annual basis and contributes to realizing a quick return of investment made by the buyer of the stove. Navagni™ also provides a simple way to refuel (using the wood from the drying chamber) to increase cooking time even further. Controlling Flame intensity (increase or decrease the intensity of the flame) during cooking is desired for better cooking and conservation of fuel and heat. A Good example of this feature can be found in LPG or Natural gas stoves where a rotary controller of sorts is used to control flame intensity. 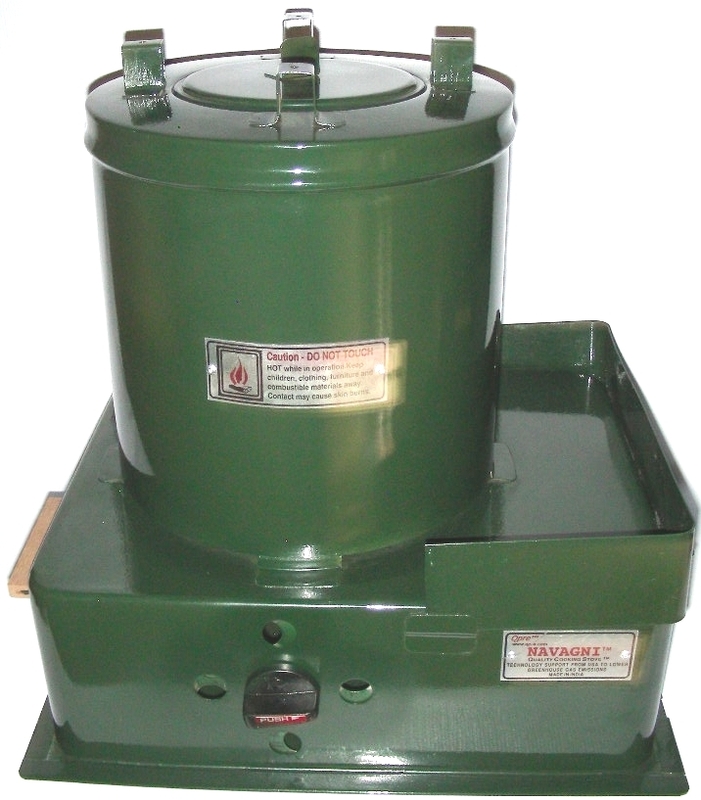 This is a new dimension in the designing of biomass fuel stoves. Compared to traditional biomass stoves like chulas, which do not have this feature, Navagni™ does provide this revolutionary concept with great pride. The pride factor is in the fact that there are no battery-operated parts that help in controlling the flame, but the flame control is achieved successfully using the enhanced technology. This is a must see feature of the stove. Burner unit in Navagni™ stove helps the flame to focus for good heat transfer to the cooking vessel. Cooking vessels as small as 3 inches in circumference are accommodated for cooking using this stove. Ash is a byproduct of anything that burns. In traditional biomass stoves quantity of ash produced is very high and the fuel might no always burn completely. Navagni™ stoves with its effective burning capability produce significantly less ash – more than 60% reduction in the amount of ash produced. The unit is designed for easy collections of the ash at the bottom ash collection tray. From sliding door facilitates easy disposal of ash without significant spillage.